here for the related gallery. Johnstone History Society welcomes submissions of personal, professional and company histories. Use the Contact form to suggest a topic or submit an article for evaluation by the editors. "This is the story of my work as a time served engineering fitter at Wickman Lang, Mary Street, Johnstone from 1971 till 1979 when the factory was closed. I had served my apprenticeship with Thomas White and Sons woodworking machine tool makers in Paisley and saw an advert for fitters in Wickman Lang as in 1971 they were expanding and paid the highest wages in the area. The hourly rate at Thomas White was 11/6 pence and in Langs 15/3 pence so an enormous increase in wages and no more buses to work in Paisley. I also stayed in Johnstone castle so the move made sense all round. I was interviewed by Jim Gibson the senior fitting foreman and told they would let me know. I waited six weeks before my mother told me a Mr Gibson had phoned and I was to call him. It appears that due to a postal strike a letter offering me employment had not been delivered. ...It was skilled work to fine tolerances which when completed had to be passed by the inspector who all wore brown dust-coats and were very strict as anything not exact was returned to you for sorting. We all worked in a long line at benches running up the length of the fitting bay with steel vices spread along the bench to hold the workpieces. As you worked you chatted and joked with all around you. Most of the worlds problems were discussed and solved especially at a teabreak when eight or nine would sit on boxes, benches and gossip, argue about football etc. ...To break the monotony you would go to the toilet several times a day with a different newspaper stuffed inside your boilersuit each time, you had to keep up with the news ha ha. Everybody bought a different newspaper and they were shared around. Another ploy was to have an assembly drawing in your hand and go for a wander to see who you could blether to and the gaffer thought you were working as you had a drawing. I had a small circle of men I had a blether with throughout the works from storemen,drillers,turners all who became good friends. The toilets as you would imagine were large and always busy and a lot of extraneous business was conducted there and you could even get your haircut as one of our labourers had trained as a barber and did a roaring trade. When the Derby race at Epsom was on the radio the toilet would be packed with men listening to various transistor radios ha ha. ...The boiler suits were part of a scheme whereas for a weekly charge you got three boiler suits with one washed every week in rotation ensuring a clean one on a Monday morning. ...The works canteen was very popular as it was both good and heavily subsidised by the company so it is no surprise that it was always very very busy. Getting to the top of the queue became an art form with all sorts of tricks being used to get out of the factory first and cross over the cobbled road to the canteen building as soon as the dinner hooter went off. ...The works were full of characters funny,sad, idiots,complete nut cases (I joke not) but it gave a variety of situations to entertain us and gossip about. One of the fork lift drivers was always crabbit in the morning but always cheery by the afternoon as he had drunk a quarter bottle of whiskey by then. ...There was an electric oven for heating up cylindrical bushes so as the metal bushes expanded with heat and were then fitted over a shaft and when cooled were immovable. However this oven was used constantly for heating Wisharts pies and sausage rolls. ...the job now needed me to think a lot more instead of following drawings on a well tried build program as there were errors in drawing calculations and machining some components. This meant our team had to come up with answers to many problems during the build and I was now involved with more of our technical personnel which I found interesting. 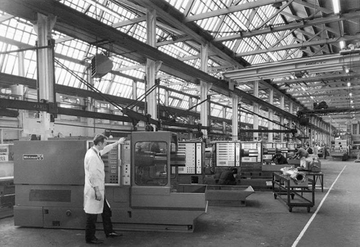 ...(the manager) had been developing an Index chuck as there were many factories across the world who had employees put a component into a chuck then complete an operation before having to stop the revolving chuck take out the component and turn it round and put it back in the chuck and repeat the same operation. Donald's idea was a chuck which you didn't stop but was able to revolve the component up to four times without stopping the chuck. This would result in major time saving and revolutionise chucking."